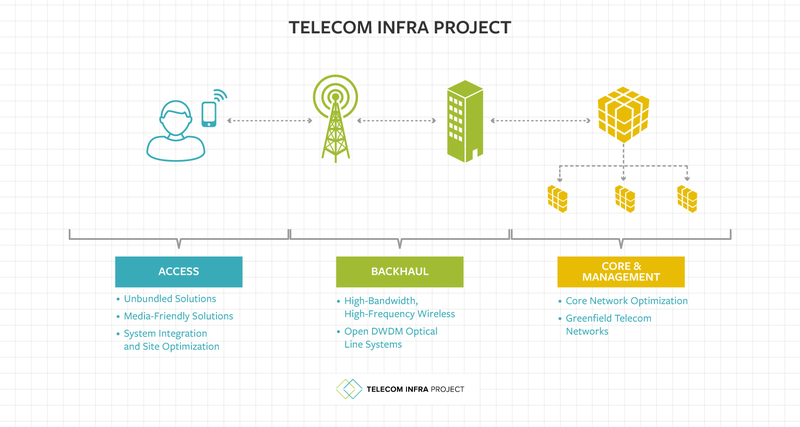 Facebook’s Telecom Infra Project (TIP) goal is to make it easier and less expensive for telecommunications companies to connect people in places that don’t have cellular service, from urban basements to rural villages. By launching the TIP initiative, Facebook is also trying to send the message that it wants to work with telecom firms rather than replace them. We know from our experience with the Open Compute Project that the best way to accelerate the pace of innovation is for companies to collaborate and to work in the open. To kick-start this work, TIP members such as Facebook, Intel, and Nokia have pledged to contribute an initial suite of reference designs, while other members such as operators Deutsche Telekom and SK Telecom will help define and deploy the technology as it fits their needs. TIP members will work together to contribute designs in three areas — access, backhaul, and core and management — applying the Open Compute Project models of openness and disaggregation as methods of spurring innovation. In what is a traditionally closed system, component pieces will be unbundled, affording operators more flexibility in building networks. This will result in significant gains in cost and operational efficiency for both rural and urban deployments. As the effort progresses, TIP members will work together to accelerate development of technologies like 5G that will pave the way for better connectivity and richer services. Facebook has joined with Intel Corp. and Nokia Corp. and carriers including Deutsche Telekom AG to share information about designing cellular networks, and to make these blueprints available for anyone to use and improve upon. The initial members of TIP comprise about 30 companies, including big and small carriers and equipment makers. The initiative is open-source, with companies soliciting ideas for design improvements from anyone who wants to contribute. Facebook’s initiative is similar to the Open Compute project it launched in 2011 to try to improve computer-server hardware. The social networking company’s move to spearhead progress in mobile networks comes amid ongoing tensions between Silicon Valley and telecom firms. Some of the world’s biggest tech and telecom firms are gathering in Barcelona this week for the mobile industry’s biggest annual conference. Telecom executives (like AT&T and Verizon) say Internet giants such as Facebook and Google Inc. are profiting at their expense. For example, telecom operators complain they do the grunt work of building towers and other infrastructure in the far reaches of the world, the backbone necessary to deliver Internet services. Online companies are mostly spared that expense. Recently, they have started to offer messenger services such as Facebook’s WhatsApp, which has eaten away at the telecom industry’s old cash cows—text messages and phone calls. The Internet services also make money off ads. Google Voice also cuts into telecom revenue for long distance calls and texts. AT&T Inc. is in active discussions to join the Facebook effort but hasn’t yet joined, according to a person familiar with the matter. Other operators remain wary of Facebook’s new initiative, worrying that it could eventually lead to a direct challenge to their core business of building and running networks. “For the time being, Facebook needs operators to test these new systems. But tomorrow, maybe they won’t need us anymore,” a European telecommunications executive told the WSJ. Tech giants have already dipped into the arena of telecom companies. Facebook is exploring ways to connect remote areas to the Internet, most notably by using drones to beam data. Google has taken a more aggressive stance, building out fiber networks and offering wireless service in the U.S.
To illustrate the advantages of testing new approaches to connectivity, Facebook, in collaboration with Globe, recently launched a pilot deployment based on TIP principles to connect a small village in the Philippines that previously did not have cellular coverage. In addition, EE is planning to work as part of TIP to pilot a community-run 4G coverage solution that can withstand the challenges presented by the remote environment of the Scottish Highlands to connect unconnected communities. Testing new technologies and approaches and sharing what we learn with the rest of the industry will enable operators to adopt new models with full confidence that they will be sustainable. Working to enable operators and the broader telecom industry to be more flexible, innovative, and efficient is important for expanding connectivity. For Facebook, TIP is a new investment that ties into our other connectivity efforts already under way through Internet.org. Facebook plans on building everything from new wireless radios—the hardware that shuttles wireless signals to and from our phones—to new optical fiber equipment that can shuttle data between those radios. Then, the company says, it will “open source” the designs, so that any wireless carrier can use them. The hope is that this will lead to better wireless networks—wireless networks that can keep up with all the stuff we’re doing on our cell phones, from listening to music and watching videos to, yes, diving into virtual reality. “These really immersive experiences are all looming,” says Facebook’s Jay Parikh. They’re looming not only for the telcos, but for, well, Facebook itself. That’s why the company is launching this new project. Facebook wants to ensure that the telcos can deliver all the video—and all the virtual reality—it will stream across its social network, all over the world, in the years to come. Late last month, Facebook launched a new effort inside the Open Compute Projectthat seeks to help telecoms improve the hardware inside their data centers. Now, it also aims to help them improve the hardware across the rest of their networks—to help them expand and enhance their networks at a much faster rate. “The only path that I know that works is to basically take a couple of pages of our playbook for open source software and the hardware and data center work we’ve done, and try to approach the telecom infrastructure problem in a similar vein,” Parikh says. Erik Ekudden—a tech strategist at Ericsson, which, like Nokia, builds much of the gear that telcos used outside the data center—also sees potential in this fundamental idea. Lessons that companies like Facebook have learned in the data center, he says, could help telcoms improve their mobile networks. But he also says that ideas can move the other way—from the telcoms to Internet giants like Facebook. Executives from a handful of top carriers said they will evaluate Facebook’s new Telecom Infra Project (TIP), but they generally offered a lukewarm view of Facebook’s stated effort to develop new technologies “and reimagine traditional approaches to building and deploying” networks. “We’ll make use of everything we can,” said Matt Beal, Vodafone’s technology strategy and architecture director, explaining that the carrier would use technologies including open source software to improve its network and services. But Beal stopped short of saying Vodafone would participate in TIP.